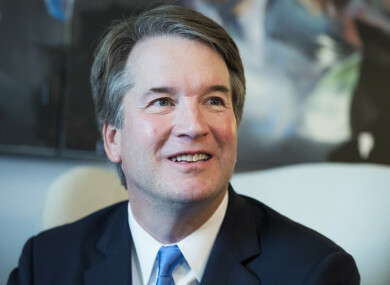 US PRESIDENT DONALD Trump’s newest Supreme Court nominee Brett Kavanaugh is expected to face punishing questioning from Democrats this week as he appears before the Senate Judiciary Committee today for the first of up to four days of hearings. Some two dozen witnesses are lined up to argue for and against confirming Kavanaugh, who could swing the nine-member high court decidedly in conservatives’ favour for years to come. Democrats have mobilised heavily to prevent his approval, arguing that while Trump faces investigation for alleged obstruction of justice and possible collusion by his campaign with Russia, he should not be able to choose a judge who could cast a decisive vote in his case. When Kavanaugh appears today for the first day of hearings, Democrats aim to show that his record as a judge and a former White House legal counsel is coloured by extremist views. They are especially concerned that his vote might allow the Supreme Court to overturn the landmark 1973 Roe v Wade case, which gave women the right to have an abortion. They are also concerned about his views that the president should be immune from investigation and prosecution while in office – issues that could come before the Supreme Court if Special Counsel Robert Mueller determines Trump violated laws. “President Trump promised to appoint justices who would automatically overturn Roe v Wade, and be pro-gun,” Senator Dianne Feinstein, senior Democrat on the committee, said on Friday. “There will be sparks at this hearing,” said Senator Richard Blumenthal, another Democrat on the committee. Kavanaugh, a 53-year-old conservative Catholic from a wealthy Washington suburb, has the backing of powerful right-wing judicial groups and deeply religious evangelical Christians – both of which are key constituents of the Republican voter base. “How did Donald Trump get 82% of the evangelical Christian vote? … Because of the Supreme Court,” noted University of Virginia political scientist Larry Sabato. Kavanaugh began his career as a clerk to Anthony Kennedy, the justice long considered a critical swing vote on the Supreme Court, who retired at the end of July. In the 1990s he worked with special prosecutor Kenneth Starr in his probe of Democratic president Bill Clinton’s affair with White House intern Monica Lewinsky, which led to Clinton’s impeachment trial. In 2001 he joined President George Bush’s White House legal team, where his role in key terrorism-related decisions, such as permitting the torture of detainees, remains unclear. As a US Court of Appeals judge in Washington for the past 11 years, Kavanaugh has ruled and written on some of the nation’s most sensitive cases, including when he opposed the Affordable Care Act, the signature health reform of President Barack Obama that Trump has sought to dismantle. “There is no one in America more qualified for this position and no one more deserving,” Trump said in announcing Kavanaugh’s nomination. Kavanaugh’s record of court opinions and legal analyses shows a mainstream conservative opposed to abortion, supportive of corporations against regulation, and – despite his work in the Clinton case – holding beliefs that a sitting president should not be distracted by legal proceedings against him. “The elephant in the room [on] Tuesday is going to be the president’s implication as an unindicted co-conspirator in very, very serious criminal wrongdoing,” said Blumenthal. He was referring to the assertion by former Trump lawyer Michael Cohen in a recent plea deal that then-candidate Trump had directed him in late 2016 to make a payment to an adult film star in possible violation of election law. Democrats are also angry that the Trump administration has not released all the records of Kavanaugh’s work while he was in the White House. But Republicans insist that his judicial history shows a fully qualified jurist able to see all sides of the law. “The American Bar Association ‘has determined by a unanimous vote that Judge Kavanaugh is Well Qualified … its highest possible rating,’” Senate Republican leader Mitch McConnell said in a tweet on Friday. Democrats have hoped that one or more Republican senators in favour of abortion rights, particularly moderate Susan Collins, would oppose him. He needs 50 votes for confirmation, and 47 Republicans have indicated their support, with 41 Democrats announcing their opposition, the Politico website reported. But Collins has appeared to accept Kavanaugh’s pledge that he respects established court precedent, which would include the Roe v Wade ruling. And some Democrats, particularly those in states won by Trump, see Kavanaugh’s approval as unavoidable and have signalled they could vote for him to appease their constituents. Email “'There will be sparks': Brett Kavanaugh Supreme Court confirmation hearings begin today”. Feedback on “'There will be sparks': Brett Kavanaugh Supreme Court confirmation hearings begin today”.